Online psychology and counseling programs are few and far between at the moment. This is due to many factors, the main factor being that schools tend to value the face to face interaction afforded by traditional programs for graduate level work in psychology and counseling. The American Psychological Association currently does not currently fully accredit online graduate programs for this reason. This means that there are very few online programs for students seeking to go into clinical psychology offered online. However, for students interested in related fields, such as family counseling, or industrial/organizational psychology, there are some options. It is important to note that APA accreditation of a program is not required for licensure in all states, but it is in some states, so you should research and find out whether or not an APA accredited program is what you need. If you need an APA accredited program, the online option may not be the right choice for you. If however, you are not seeking licensure, or you are in a state where APA accreditation is not required for licensure, then an online program can be a strong choice. 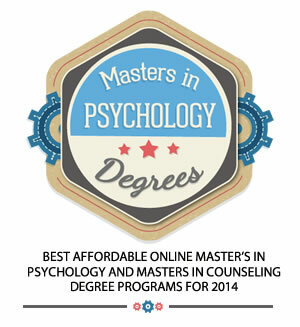 This is a list of the 15 best online programs in psychology currently offered. We define “Best” as schools nationally ranked by a prominent ranking authority. Accreditation in this case is limited to the basic requirement of regional accreditation, since the APA does not accredit online programs. We also judge schools based on affordability. We define “affordable” as full programs for which the tuition is under the $30,000 national average. These schools were selected from among 21 online psychology and psychology related programs. The schools were selected based on their ranking, where schools were tied for the last spot, the school with the lowest tuition was selected. The Chicago School of Professional Psychology is a graduate school devoted fully to graduate education in psychology. The school’s focus means it boasts high quality programs. The American Psychological Association doesn’t currently accredit online graduate programs, but all of the Chicago School’s traditional programs are APA accredited. The school strives to bring the same excellence to the online format. The tuition is above the national average for graduate program tuition, but the school is still a strong choice for those that can afford it. Palo Alto University was previously the Pacific Graduate School of Psychology. PAU is still primarily focused on graduate education in psychology, though the school does offer three bachelor’s level psychology programs. The school also maintains a relationship with Stanford University’s school of medicine. The school’s price tag is just over the national average for graduate programs, but the school’s reputation and the quality of its programs will still attract many students. The most expensive school on our list at almost twice the cost of the national average for graduate programs, USC is one of the top schools in the United States. Students may pay more, but the reputation of USC counts for a lot, and would open up many doors, both academic and professional. The program is expensive, but students that can afford the expense will receive a top flight education from one of the most respected schools in the United States. Austin Peay State University prides itself on maintaining high standards and an academically rigorous approach in its online Industrial/Organizational Psychology program. The program combines the examination of I/O Psych theories with case study applications taken from real settings. This is designed to prepare the student for a career in the field, whether it be in industry or the government. The focus of this program not clinical psychology practice. Instead, this program is designed for people that want to work in fields where they will be involved with children, families, and adults. The program will teach students how to help people in difficult situations, and to help provide solutions to the problems they face. Accolades: Ranked #142 among the Best National Universities by U.S. News and World Report. Walden has been around for longer than many of the for-profit distance education schools. They have held their regional accreditation since 1990. The tuition is affordable and the programs offered can be of great use to many students. Bill Clinton, the 42nd President of the United States is the honorary chancellor of Walden University. Capella University is a private, for-profit university and is one of the cheapest of the private for-profits on this list. Capella offers extensive undergraduate, graduate, and doctoral programs, of which a M.S. in Psychology is one. The psychology program is geared toward preparing students to work in fields related to psychology and mental health. Kaplan is one of the oldest private for-profit universities, founded originally in 1937. Kaplan’s history is peppered with scandals that have undermined its credibility including alleged misrepresentation of its programs, and false claims lawsuits. The school included in this list because it fits the criteria, however students should proceed with caution. Many students may find the programs meet their needs, however some extra research to confirm this is recommended. This Roman Catholic university is one of many such universities that have begun offering online programs. The MSAP program offers an Industrial-Organizational Psychology concentration, and a Community Psychology concentration in addition to the General Applied Psychology concentration. The program is designed for flexibility and students in close proximity to the school can take the hybrid track which is designed to provide both the flexibility of the online format, with many of the benefits of traditional face to face programs. One of the least expensive graduate programs in psychology available online, SNHU is a strong choice for students regardless of their residency. The online program is an M.S. in Psychology, with a focus on Industrial-Organizational psychology. The field of Industrial Organizational Psychology is one in which professionals are not required to be licensed by the state in order to practice. Indeed the Society for Industrial Organizational Psychologists states that only 21% of full time practitioners are state licensed psychologists. One of the primary goals of this program is to prepare students to enter a doctoral program in psychology. The MA in Psychology program at APU is designed with the fact that it’s not a terminal degree in the field in mind. The program, while not accredited by the APA (as the APA does not accredit online graduate programs currently) is written in compliance with the APA’s curriculum guidelines. The tuition is one of the lowest on this list. APU is a strong choice for students looking to earn their graduate degree online, and pursue a doctorate program. Colorado State University is one of the foremost public universities offering online programs. Their MAIOP program is perfectly suited to students interested in the field. There are many opportunities for people with such degrees as many major corporations, government agencies, and academic institutions employ Industrial Organizational Psychologists, and one does not need to be state licensed in order to practice in this capacity, making the question of APA accreditation requirements by some state licensing boards a non-issue. LeTourneau University is a private Christian university. The online psychology program is designed to provide students with a scientific understanding of psychology with the added perspective of Christianity regarding application. The school’s program is designed for students interested in pursuing further education in the field, and for students interested in working in psychology related professions and the church setting. Kansas State University offers a strong Master of Arts in Industrial Organizational Psychology degree. A nationally ranked and recognized state university, affordable tuition, especially for residents, though the tuition for non-residents is still under the national average tuition for a graduate program. The program is designed so that graduates will be well rounded, having the necessary communication skills, to communicate effectively in the corporate setting, and the quantitative analytical skills to develop effective training programs, and identify potential problems. The single lowest tuition on this list belongs to the University of North Dakota, which extends its incredibly low price tag to residents and non-residents alike. UND is a nationally recognized and ranked public university with a track record of providing students with high quality, flexible, and affordable programs regardless of their location. The MA in Forensic Psychology program teaches students the fundamentals of psychology, paired with extensive instruction in the workings of the legal system, to enable them to provide insight and advice to law enforcement, attorneys, and more. This emerging field offers many opportunities and much room for application and exploration.